Started 9th and finished fifth.
. Told crew he needed more grip throughout opening run. Crew made adjustments to help the handling. Brushed wall on lap 30 but crew reported the damage was minimal. Turned ultra-fast lap times during the run. Broke into the top-five on lap 94 and held his position until the end of the stage. Started fifth and finished second. Moved into third on lap 176 and second on lap 195 as stage ran without caution. Approached the leader in closing lap of the stage but could not make the pass. Best stage finish since he won Stage 2 at Pocono (Pa) International Raceway in July. Started third and won the race. Took over lead on lap 285 – his first laps led of the 2018 season – and led all but one lap the rest of the way for a total of 215. The only lap Bowyer did not lead during that final stretch was during the final pit stop of the day on lap under the only incident-related caution of the day. Bowyer was the first off pit road to regain the lead during that final pit stop and got away cleanly from the outside lane on the lap-390 restart. He crossed the finish line 1.146 seconds ahead of second-place Kyle Busch. 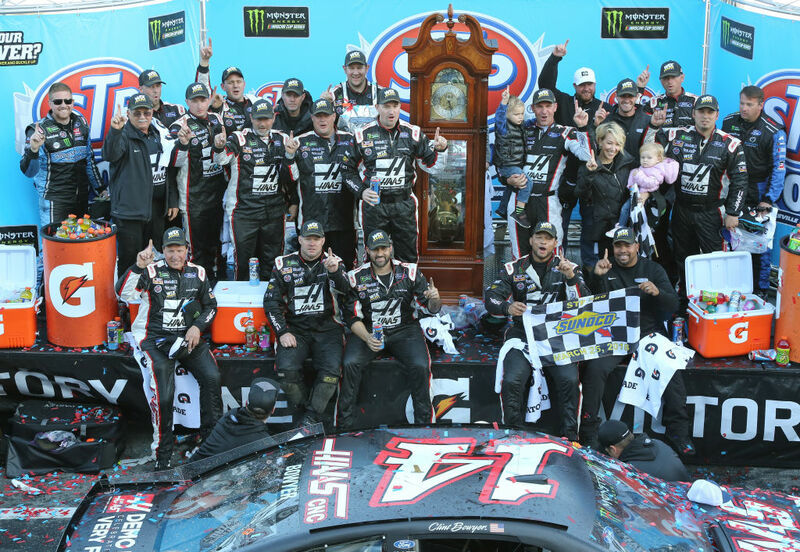 This was Bowyer’s first Cup Series victory since joining SHR in 2017 and his first since winning on Oct. 13, 2012, at Charlotte (N.C.) Motor Speedway. This was Bowyer’s first win and third top-10 finish of 2018, and his first victory in 25 career Cup Series starts at Martinsville. Bowyer led twice for a race-high 215 laps to bring his career laps-led total at Martinsville to 571. The 215 laps led Monday were more than he led in seven of his previous 12 full-time Cup Series seasons. With the win, Bowyer earned five playoff points. He finished fifth in Stage 1 to earn six bonus points and second in Stage 2 to earn an additional nine bonus points.